Coming Saturday: SoOnCon & Night\Shift! Get there! 1. Night\Shift – Saturday, Nov 2, 2013 – 9pm to 3am (yes, 3am) – a nuit blanche-style stay-up-late festival of art, culture, and other interesting stuff. Free-no-pay. 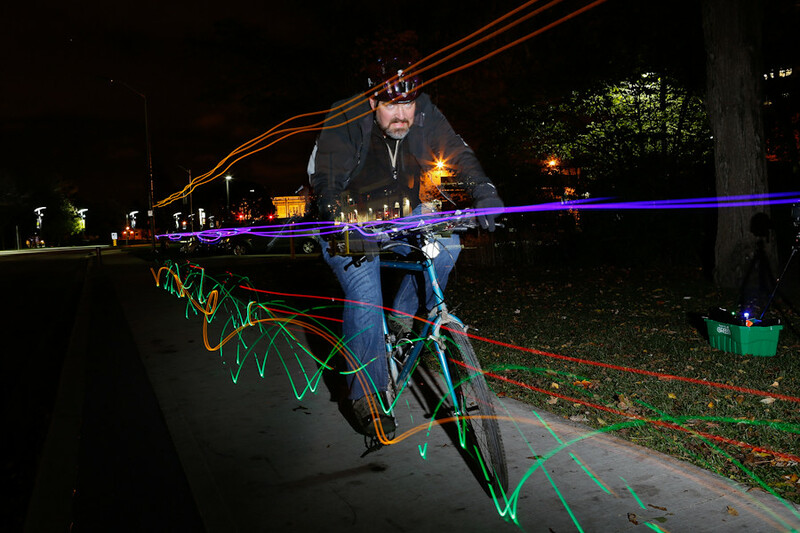 Fellow photog, Joe Martz, and I will be running a show-us-your-bike-face “photobooth” at Queen and Otto across from Centre in the Square. 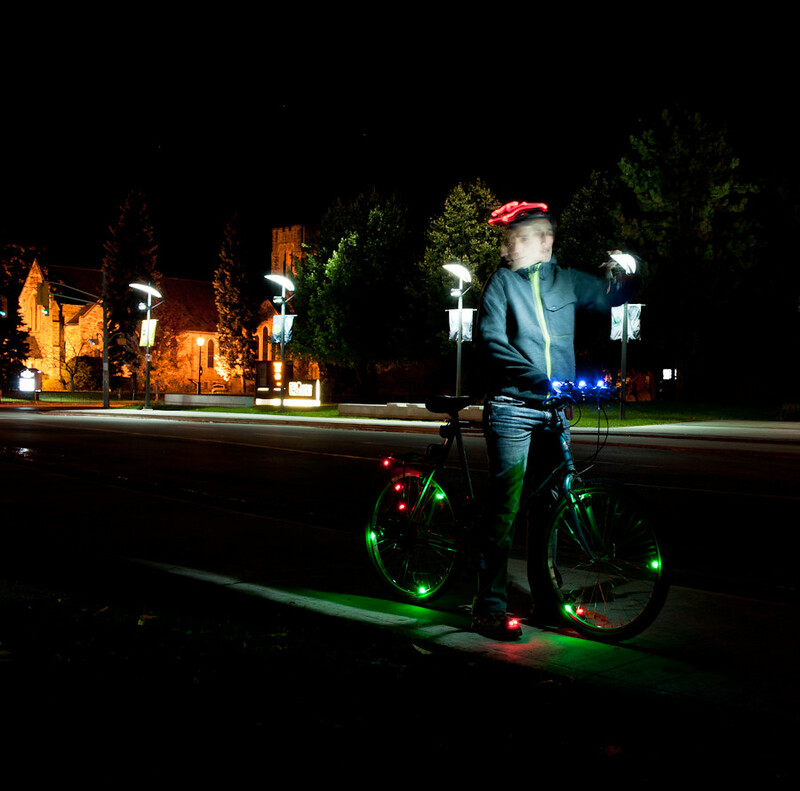 You ride the LED bikes I cooked up, we shoot your photo, you become famous. Test shot of Joe, in the snow, above. If it’s cold, that only serves to enhance your bike face, so don’t be shy. 2. SoOnCon – Saturday, Nov 2, 2013 – 9am to 5pm – now in year 5(! ), this conference of Southern Ontario Makers and Hackerspaces features lots of great people, great talks, and great workshops. I’ll be giving a talk at 10:45 in Classroom 3 on hacking your camera with CHDK (Canon Hacker Development Kit). **no camera required! 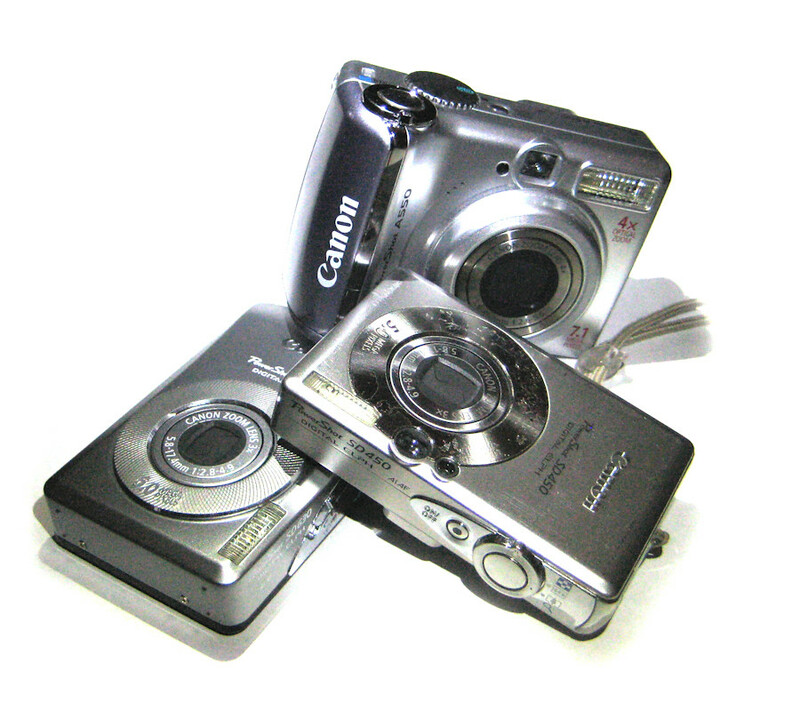 ** I’ll speedtalk you through buying these cheap used cameras on kijiji, to setting up CHDK which is alternative software for Canon PowerShot cameras, and then show how I’ve used these cameras in projects like my DISCONNECT show. You gotta register to attend SoOnCon: do that here. Only $40 and you get a cool, hackable, blinky badge, which at the later Night\Shift event will make you stand out like the maker you are. Tip o’ the hat to Cdub, for being my first test pilot. Totally proved the concept. Here’s Joe out front of CITS on the Light Bike, just before everybody came streaming out of the Ron Sexsmith show and avoided us like aliens. Oh, WR… Pretty simple really: took some 10mm LED throwies, which include there own LR44 batteries, and taped a bunch of them all over the bike, including the wheels. 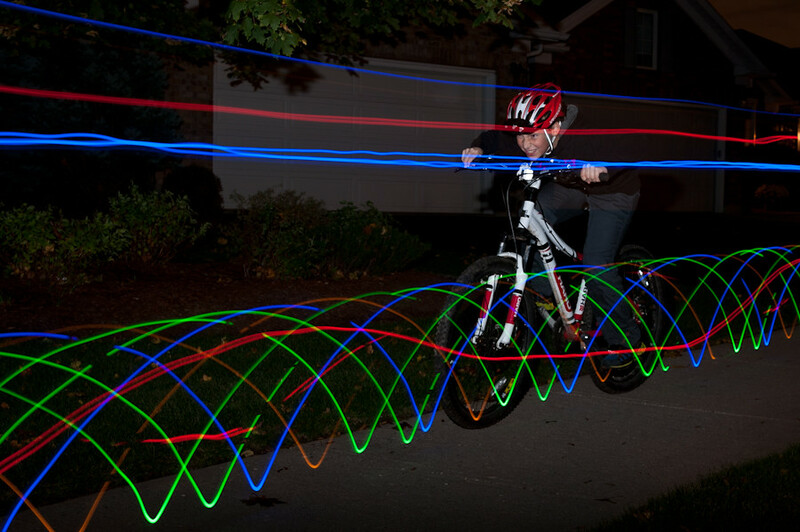 With the camera set up on a tripod, we have you ride *slowly* through the frame, with the camera shutter still open, making these wonderful light trails. 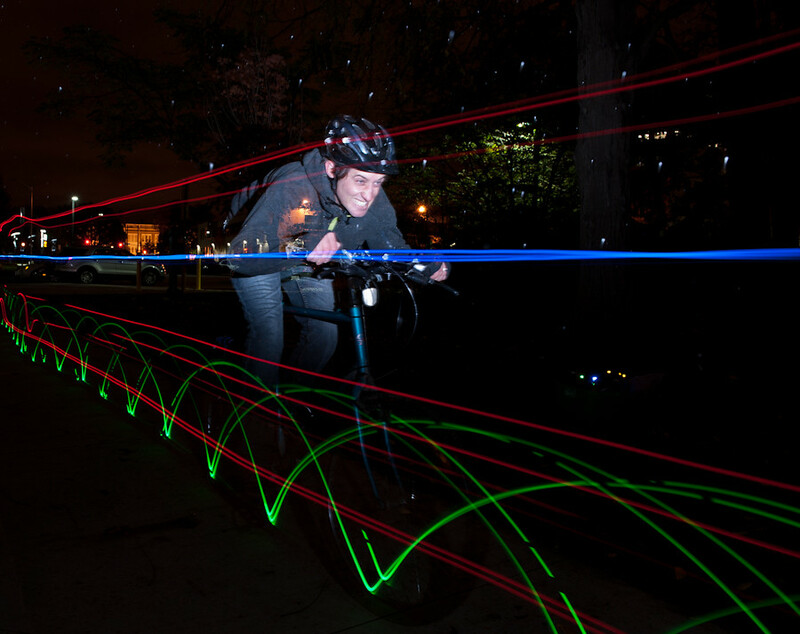 At the crucial moment, we flash a strobe on you to very briefly light you up so we get a more or less frozen image of your bike face, while preserving the light trails. 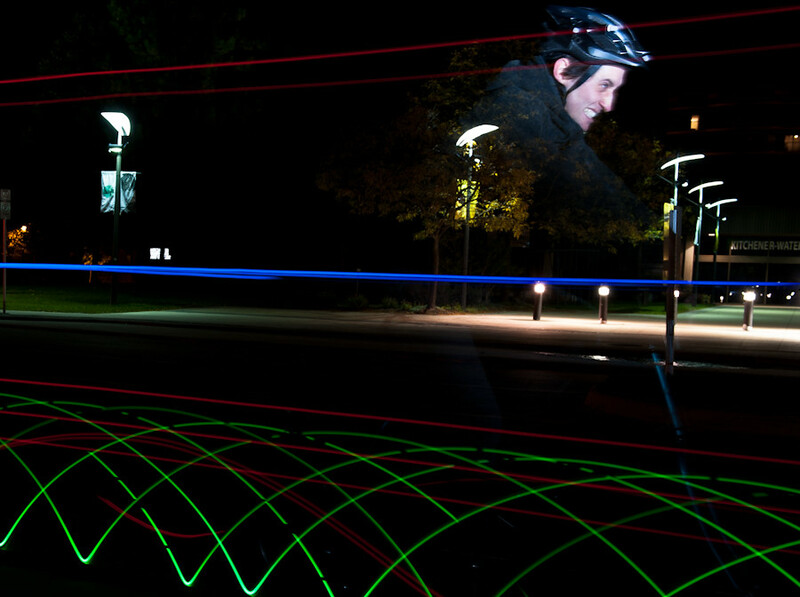 For you photogs out there, we prefocus the best we can, establishing a spot in the lane where we’re going to strobe you. 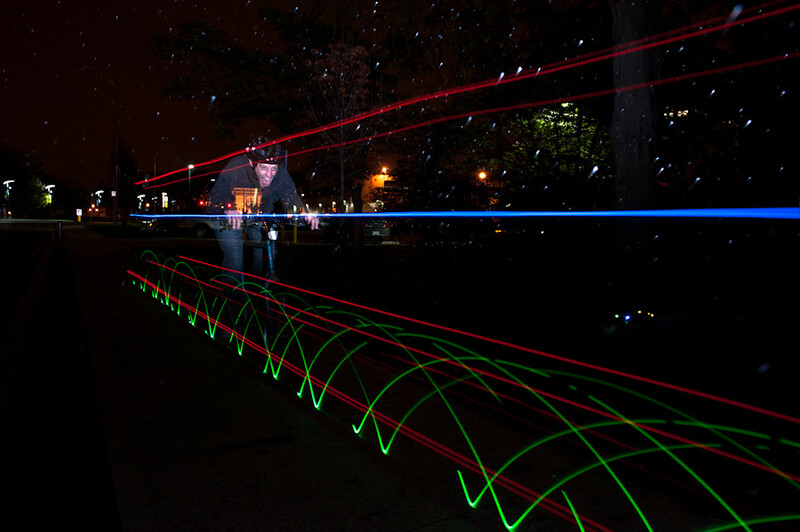 Shooting both Canon 5D Mark III (Joe) and Nikon D3 (me), set at ISO 100, f/8, with shutter times of 5-6 seconds using a cable release. We’re hoping to project these photos onto… something on-site to show ‘em off, and also to share them on the web. I’ll blast something out on Twitter as the event kicks off so you can have a look. This entry was posted in event and tagged hack, Kitchener, kwartzlab, LED, nighshift, sooncon. Bookmark the permalink.